A game that works with a spatula! Carole the cow makes funny recipes! But she is missing eggs, carrots, hazelnuts and chocolate. Listen carefully to her instructions and find the right ingredients to help create her masterpiece. 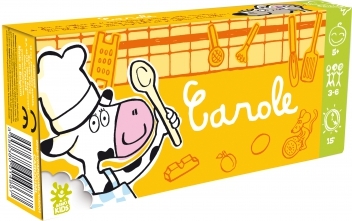 One player takes on the role of Carole: that player takes the spoon and draws a recipe card. The player must knock a certain number of times according to what's shown on the recipe card, letting the other players know which ingredients are required by Carole. The other players listen carefully and then look at the ingredient cards and try to find the one which corresponds to the directions they've heard. â€¢A game of speed and reflexes, and memory. â€¢Carole also introduces the concept of syllables to young children.